ABC, official home of combustible but “traditional” mom, dad and the kids nuclear families, adds its ninth with Speechless. And a 10th is coming in mid-October with American Housewife. Even in the days of Leave It to Beaver, has a single broadcast network ever banked so heavily on domestic lives for laughs? Once the fall wave subsides, I’ll do a little further research. The incumbents are Modern Family, The Middle, The Goldbergs, black-ish, Last Man Standing, Dr. Ken, Fresh Off the Boat and The Real O’Neals. Together they cover a lot of bases, races and sexual identities. 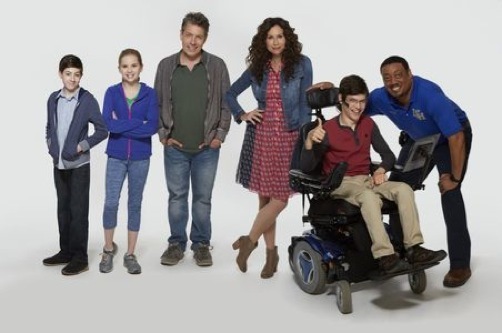 But Speechless is ABC’s first sitcom with a real-life special needs kid. Micah Fowler plays JJ DiMeo, who’s in a wheelchair, is non-verbal and communicates via his expressions and an alphabet tablet. Minnie Driver otherwise is the very vocal focal point as JJ’s very highly insistent mother, Maya. This is a fierce performance but not an off-putting one. And after a ridiculous opening bit -- in which Maya recklessly drives the entire family to a restaurant whose 50 percent off coupon will expire in three minutes -- both Driver and the show settle into a solid and for the most part amusing groove. The DiMeos have continually moved around in deference to Maya’s search for the elusive “perfect situation” for JJ. Their latest travels take them to upscale Newport Beach, where Maya has found a barely affordable but severely dilapidated and badly located house. Maya’s husband, Jimmy (John Ross Bowie), is close to being a doofus dad but also has an appealing whimsy gene that makes him more than a one-note Dagwood Bumstead. The other two children are daughter Dylan (Kyla Kenedy) and other son, Ray (Mason Cook), who feels kind of neglected. At JJ’s latest new school, where he’s rather condescendingly welcomed as a “hero,” a groundskeeper named Kenneth (Cedric Yarborough) enters the picture to both spar with Maya and gradually bond with JJ as his new ad hoc caregiver. In case anyone might wonder for even a second, Maya greatly objects to any use of the word “cripple” while demanding that JJ gets an access ramp at the school entrance rather than at the back end where deliveries are made. Driver acts up a storm that borders on a typhoon in Wednesday’s stage-setting premiere episode. Her character is ever over-compensating while son Ray chafes before finally speaking his mind in a scene that’s both obligatory and affecting. JJ emerges as a character for whom one feels empathy but not pity. He’s got his own ‘tude, which brings home the point that people with disabilities want to be treated with respect but not as though they’re made of easily breakable porcelain. ABC family comedies with moms afire date to the network’s groundbreaking Roseanne. The network already has a very formidable roster, whether it’s Patricia Heaton’s “Frankie” Heck (The Middle); Wendi McLendon-Covey’s Beverly Goldberg (The Goldbergs); Tracee Ellis Ross’ Rainbow Johnson (black-ish); Sofia Vergara’s Gloria Pritchett (Modern Family; Constance Wu’s Jessica Huang (Fresh Off the Boat; or Martha Plimpton’s Eileen O’Neal (The Real O’Neals). Driver’s Maya is so imposing that the cops won’t arrest for her for speeding because it’s just way too much of a headache. But whether behind the wheel or otherwise, she’s the driving force of a show that otherwise introduces a sitcom kid we haven’t seen before. In an ideal world, his disability will cease to be any kind of a “gimmick” as Speechless strives to become a funny series above all else.